The 2018 Emirates Australian Open has several guaranteed crowd-pullers with last weekend’s revelation that former US PGA champion Keegan Bradley would be heading Down Under to play at The Lakes. Bradley joins another in-form American in Brandt Snedeker in giving the Open just the filip it needs to ignite Australian golf this summer. Bradley is quite a character, with a big following on the US Tour. He won the 2011 US PGA Championship and is a four-time winner on the multi-million dollar US PGA Tour. He’s bound to draw a crowd when he tees it up at The Lakes from November 15-18. “I’ve heard a lot about the Aussie Open and all the historic names on the Stonehaven Cup,” said Bradley. “Now I can’t wait to have a shot at putting my name on it. “And to come to Sydney at that time of year is something I’m also really looking forward to. 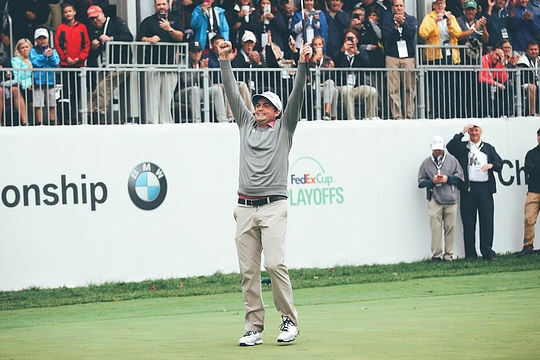 Only 32, Bradley soared back to his best late in the season when he won the coveted BMW Championship, the third leg of the FedEx Cup playoffs, which took him back to No.31 in the world. Joining Bradley in making their Open debuts are two other genuine contenders for the 103rd staging of the Open, three-time PGA Tour winner Brendan Steele and rising Mexican star Abraham Ancer. Steele, 35, has won in each of the past two PGA Tour seasons, both times at the Safeway Open on top of his Valero Texas Open victory in 2011. Ancer, 27, was twice in the top five on this year’s PGA Tour and came within minutes of a huge breakthrough win in the FedEx Cup playoffs, leading until the closing holes of the Dell Technologies Championship in Boston last month. The trio joins American stars Matt Kuchar and Brandt Snedeker as confirmed starters at The Lakes.